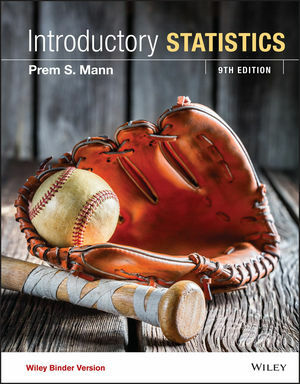 Introductory Statistics, 9th Edition is written for a one or two semester first course in applied statistics and is intended for students who do not have a strong background in mathematics. The only prerequisite is knowledge of elementary algebra. Introductory Statistics is known for its realistic examples and exercises, clarity and brevity of presentation, and soundness of pedagogical approach. Prem Singh Mann was born on November 20, 1947 in Punjab, India. Came to the United States, 1980. Bachelor, Panjab University, Chandigarh, India, 1968. Master of Arts in Economics, Panjab University, Chandigarh, India, 1970. Master of Arts in Economics, Manchester University, England, 1977. Doctor of Philosophy in Economics, University of California at Los Angeles, 1988. •WileyPLUS with ORION: WileyPLUS is equipped with an adaptive learning modulecalled ORION. Based on cognitive science, WileyPLUS with ORION provides students with a personal, adaptive learning experience to build their proficiency on topics and use their study time more effectively. It helps students learn by learning about them. • ORION Refresher Module: An adaptive practice to master algebra skills providesstudents with a personalized study plan to master concepts prior to the course, allowing for instructors to focus class time on Introductory Statistics. •New Exercises: A large number of the examples and exercises are new or revised,providing contemporary and varied ways for students to practice statistical concepts, including updated Uses and Misuses sections as well as Decide for Yourself sections. •Case Studies: All case studies are new or revised, drawing on current uses of statistics in areas of student interest. •Updated Technology Instruction sections: These sections have been updated tosupport the use of the latest versions of TI-94/85+, Minitab, and Excel. The Technology Assignments are all either new or have been updated. •WileyPLUS is a research-based online environment for effective teaching andlearning. Interactive study tools and resources–including the complete online textbook–give students more value for their money. •Industry-leading support from WileyPLUS with ORION:Resources and personal support are available from the first day of class onward through technical support; WileyPLUS account managers; WileyPLUS with QuickStart; and WileyPLUS Student Partner Program. •Thorough Examples: A wealth of examples that cover a wide variety of relevanttopics, based on real data taken from government and private data sources and reports, newspapers, magazines, and professional journals. •Enlightening Pedagogy: Effective markers and aids for students including: marginnotes for examples; diagrams; highlighted key definitions; and cautions about potential trouble spots that commonly caused errors.